The purpose of this lab is to learn how to prepare a wet mound, to learn proper staining techniques and to examine human cheek cells and onion skin cells. It is predicted that all cells, no matter if it be plant or animal, will be in beside each other in large groups, that most of the major organelles will be visible through the microscope at 400X total magnification, the individual cells will be approximately 0.05mm in length/diameter.. When observing the onion skin cell, we noticed that the cells took on a brick-like structure and within the cells, small dots (the nuclei) can be seen. When we first looked into the microscope, the microscope’s total magnification was 40X so there were about a hundred rows of rectangular cells (see diagram provided), but as we changed magnifications, the number of cells in the field of view decreased. all had a round shape. When we viewed the cheek cells at 40X total magnification, we noticed that the cells were secluded and spread out (see diagram provided). At 400X total magnification, we were only able to view one cell at a time, due to the fact that the cells were separated from each other. The organelles that were visible in this type of cell were the nucleus, the cytoplasm and the cell membrane. Aside from the actual cells, we were able to see air bubbles within both the onion skin cell slide and the cheek cell slide. proving the statement wrong. Another statement that was incorrect was my estimation of the length/diameter. I stated that both the cells were about 0.05mm in length/diameter. Though it looked like the animal cell was slightly smaller, according to my calculations (diameter of FOV/# of times the object can fit across the FOV), the approximate length/diameter of the cells (both plant and animal) were 0.13mm. A correct statement in my hypothesis was that most of the important organelles are visible through the microscope. The important organelles that can be seen are the cell wall (for the plant cells), the cell membrane, the nucleus, and the cytoplasm. We can see those organelles due to the fact that they are the largest organelles in the cell and also due to the dye which brought them out. The final statement in my hypothesis was that the overall image will not be clear enough for further detail. This statement was correct because, other than the nucleus, the cytoplasm and the cell membrane/cell wall (for plants only), we cannot see any other organelle; the microscope simply didn’t have enough magnification to see them. 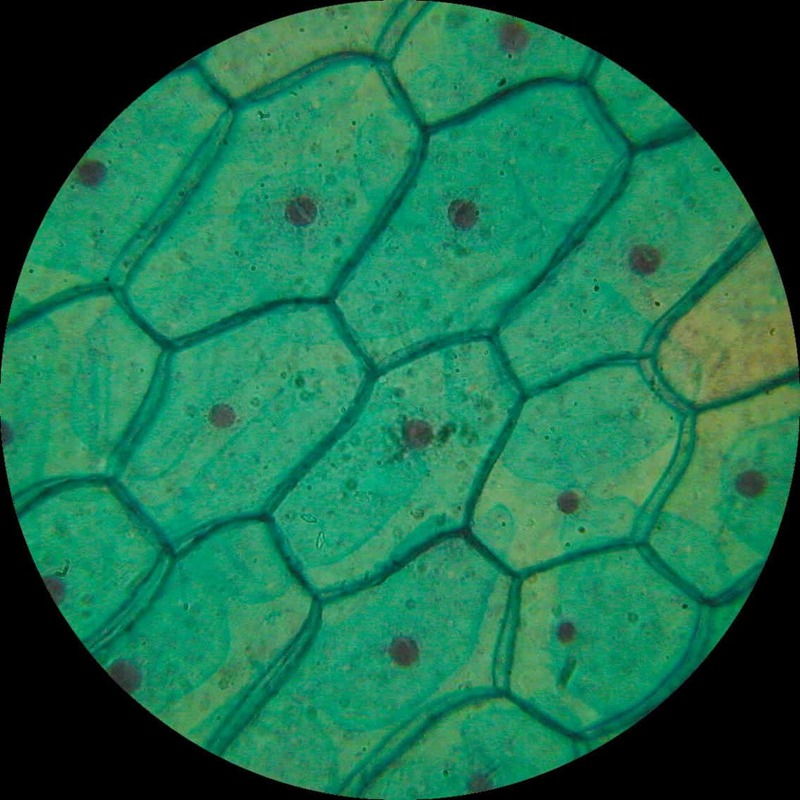 Overall, I have learned that onion skin cells (plant cells) are rectangular and are always with other plant cells and cheek cells (animal cells) are circular and are secluded from each other, and that the smaller organelles cannot be seen with just our school microscope. Knowing that certain cells are different from other cells is important in our world for many reasons. The cell is the most basic unit of life and knowing about it will help us answer many different questions. If someone knows about the cell and how it works they could find a way to counteract viruses and illnesses, thus creating medicine and a way to cure the virus or illness. Without knowledge of the cell, we wouldn’t know about how we get our energy, how we use our five senses or even how we exist. We should know about the cell because it helps us understand that every cell has an individual job to fulfill and those cells let us do what we can do now. The cheek cell, an example of an animal cell, generally has a circular, oval shape. Due to the fact that the cheek cell was not in groups or clumps, the arrangement of this type of cell is unknown. From previous labs, I remember that the cells were pushed together completely; each cell fitted beside another cell perfectly and so on. The animal cell structure is the most prominent in human cheek cells. The onion skin cell, an example of an animal cell, generally has a rigid, rectangular shape. The onion skin cells were positioned beside each other (length touching length, width touching width) and formed a checkered pattern. Also, like the cheek cell, the onion skin cells were pushed together so that no spaces were in between. Two differences between a cheek cell and an onion skin cell are that the onion skin cells has the chloroplast and cell wall organelles while the cheek cell doesn’t and the general shape of the onion skin cell is a rectangle and the general shape of the cheek cell is an oval.